Omaha Sunday World-Herald | What Cheer In a Cemetery Where Birds Find Paradise. May 21, 1916. Omaha Sunday World-Herald 51(35): 3-M. Includes four pictures. Greenleaf and Marsh at Forest Lawn cemetery. 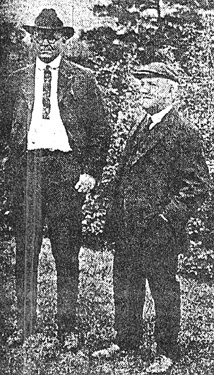 Miles Greenleaf and "Billy" Marsh, the long man and short man of the woods. As we entered the Forest Lawn cemetery bird sanctuary last week, a big male cardinal sat upon one of the huge masonry gate-posts and welcomed us most cordially. "What cheer!" he exclaimed whole-heartedly. "What cheer-whew!" Well might Mr. Cardinal be delighted and unafraid, for the vast stretch of the beautiful acres in this cemetery has been consecrated not only to the human dead but to the birds living and the half a hundred employees constantly patrolling the confines thereof are as diligent in the protection of the songsters as in their other more sombre duties. This cardinal and his good wife have a nest in a fir tree in a tiny triangle formed by a much traveled roadway, the cemetery office and the noisy street car terminal. Hundreds of people see them and adore them each day and even part the heavy branches of the fir to inspect the growing nest - yet the cardinals merely flit a few feet away, whistle their cherry song and return anon to their devotional home-building. Few who have attempted the study of bird life know how difficult a thing it is to find a cardinal upon the nest, and how timid these glorious redbirds are in the parks and public woods. Is it not strange that they should know that Forest Lawn cemetery is sanctuary for them, and that they are as safe therein as in the sequestered depths of the forest primeval? Yet that is the case, not only with happy family of cardinals, but also with three score other varieties of songsters which have also found perfect peace, quiet and contentment within the safe borders of this burial place. 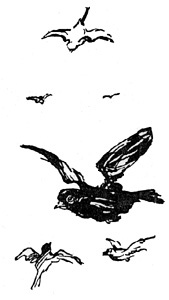 Sketch of flying birds for cemetery sanctuary. Omaha has much to be proud of, many substantial features that have made her the envy of the whole country, but her recent awakening to the necessity of studying and conserving wild bird life is perhaps the most remarkable of them all. Remarkable as it seems to grudging eastern newspapers that Omaha, the busy mart grown in the wild and wooly, western plains, should take th lead in the preserving of songbird life, following the example of a few New England cities which realized the folly of bird destruction when the enlightenment was nearly too late. Know then, you Omahans, that Forest Lawn cemetery is the biggest and best protected bird sanctuary in the whole United States, even excelling the famous Woodlawn cemetery of New York, where Ernest Harold Baynes, the great naturalist, has spent many days in the attempt to encourage and protect bird life. To H.S. Mann, secretary of the Forest Lawn Cemetery association, belongs most of the credit for this great sanctuary, which the birds seem to welcome and appreciate as the haven for which they have yearned since civilization and its gunpowder invaded the west. Himself a lifelong lover of the songsters, Mr. Mann last fall addressed a letter to the National Association of Audubon Societies at New York, suggesting Forest Lawn as a bird sanctuary and asking advice as to procedure. It is interesting to note that about three weeks after this letter was mailed, the National Audubons sent broadcast, through the medium of the Associated Press, an invitation to all cemeteries in the United States to turn these burying grounds into bird sanctuaries! Mann, father of bird sancturay at Forest Lawn. H.S. 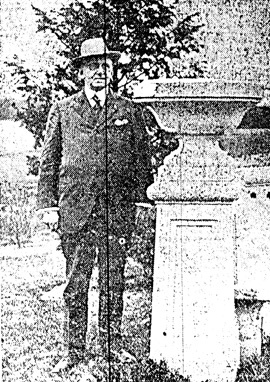 Mann, father of bird sanctuary at Forest Lawn. Whether or not Mr. Mann was actually the instigator of this great campaign to preserve over one million acres of already consecrated ground in this country into bird sanctuaries may never be known, but the facts are extremely suggestive. Being a member of the Nebraska Audubon society at the time of its rejuvenation last fall, Mr. Mann discussed Forest Lawn as a sanctuary during one of the regular meetings of that society at the public library. His suggestion was enthusiastically received and on December 14 Dr. Solon R. Towne, president of the Nebraska Audubons, addressed the board of directors of the Forest Lawn Cemetery association on the sanctuary suggestion and was cordially received. About a month later, acting with authority tendered him by his directors, Mr. Mann wrote the board of education offering to furnish materials for the construction of bird houses to be made by the pupils in the manual training classes of the Omaha schools to be later placed in Forest Lawn. This communication was tabled. Nothing daunted, Mr. Mann ordered forty bird houses from the boys of Fort school, and these are now seen throughout the cemetery sanctuary. Nineteen of these houses were especially designed for wrens and upon our visit a week ago to Forest Lawn we were astounded to find that every one of these houses were occupied, as well as many bluebird houses! Very naturally the biggest feature of the Forest Lawn sanctuary is the absolute protection and genuine affection afforded the songsters, and who will ever know what balm these gloriously feathered friends have given the wounded hearts gathered about a graveside at the Final Moment - in return for this affection? Far upon the crest of the most commanding hill in the cemetery is the lot and vault owned by Mr. and Mrs. George A. Joslyn. To the west are the scores of unimproved acres of fields and tangled underbrush, a veritable paradise for certain kinds of birds. To the east are the thickets of healthy trees, bushes and vines, well kept lawns and walks and roadways. This is the meeting place for all varieties of songsters and here Mrs. Joslyn, ever an untiring worker in bird protection, has erected two giant bird baths of ornamental marble construction. Every day and all day they are constantly patronized by the grateful warbles and add much to the value of the sanctuary. Billy Marsh and the writer last week paid our first visit to Forest Lawn since it had been made a haven for the birds, and were astounded at the number of songsters, as well as the number of varieties which fluttered about at our feet or in the trees but a few yards away. Seemingly fearless and perfectly confident that we were their friends, they apparently welcomed our presence. Not a couch in this last resting place of those who have gone away but that the deep-throated warble or the cheerful twittering of heaven's own choir serenaded in a continual song of hopefulness and peace. For twenty-five years Billy Marsh has stalwartly and perhaps silently studied and harbored the songbirds to the best of his ability, and the recent success of the Omaha campaign for a general interest in this great work has given him a great happiness. Therefore, when he stood with bared head before a large and simple monument in the very heart of this sanctuary of the birds he has loved for so long, I stole a glimpse of the stone. Upon it was graven the name of his father, long since dead, Captain William Wallace Marsh, an Omaha pioneer. Billy Marsh is by no means a demonstrative man, but one could not help feeling that the birds gathered about his father's grave are in a way his offering of affectionate remembrance, for he has had as much as anyone to do with the late movement for bird conservation here. So, aside from Woodlawn cemetery in New York city, Omaha has the first and only cemetery bird sanctuary in the United States - Forest Lawn. Also it is the largest and best kept, which Baynes himself admitted. During our brief morning rumble through the busiest part of Forest Lawn on that quiet May day we listed thirty different kinds of birds, which would be by no means remarkable were it not for the fact that these songsters were mostly out in the clearing, in the well trimmed tree, almost within arms' reach. Had we taken to the undisturbed jungles which are as much a matter of pride with the Forest lawn association, we could doubtless have doubled that number. But here in the beauty of the sanctuary - that it has taken the feathered clans but a few brief months to ascertain that Forest Lawn welcomes them and that the human beings within those boundaries are unqualified friends of the birds. Outside the limits of the cemetery the songsters are no more plentiful than in any other wooded section or rolling prairie - inside they are myriad. Besides the cardinal, gorgeous guardian of the outer portals, we found ourselves hobnobbing with scarlet tanagers, brown thrashers, wood thrushes and catbirds which amiably shared the paths and roadways with us. Many different sparrows busily fluttered under foot about the green-sward, while white-breasted nuthatches, chickadees, bluebirds, Baltimore orioles, rose breasted grosbeaks and other beauties in this haven of refuge greeted us at every step. Bronzed grackles squeaked and gurgled about the pines, while a pair of mysterious cowbirds entertained us with their wiry squeals scarcely ten feet distant. Perhaps the total list might be of interest, for it was made within an hour as easily as if you had the same birds all in your front yard some morning. Nearly every one of these songsters can be found within a block of the main entrance to the Forest Lawn bird sanctuary. These birds were present mostly in very large numbers, and many of them busy in nest-building or caring for their young. Time did not permit the running down of migrant warblers which were known to be present, nor the search of the outlying fields for such common birds as the meadow lark, the dickcissel and others which are seen to be missing from the list. But all were there, for their songs were heard. There is an added mystery and delightfully sporty possibility of seeing a Chinese pheasant, within the confines of this sanctuary, too, for some years ago a certain amateur ornithologist released a number of these wondrously beautiful birds in the cemetery woods, and they are still occasionally seen. As a matter of fact, of the seventy-eight birds identified by the state ornithologists during their field day at the Fontenelle reserve on May 6, there is not a one but which might be identified at the Forest Lawn reserve - and that exception is the solitary sandpiper. Forest Lawn is on the hills, far from the river, where water birds will seldom, if ever, be seen. While we were standing outside the beautiful chapel near the cemetery-sanctuary entrance a laborer hurried by with a double-barreled shotgun. "What's that fellow going to shoot?" sharply inquired the alert Billy Marsh. "I don't know - but not birds, that is sure!" answered Mr. Mann. Presently there was a loud report - then another. We hurried to the scene and found that two gophers had hit the dust. They had been attempting to ruin a section of the law. When the two explosions occurred we instinctively looked for a big flight of the birds to safety. But they evidently knew that the gun was not for them. A few fluttered into the air, but immediately sank again to attend to their respective businesses. The sanctuary apparently had no terror for them, even if bristling with shotguns. Of the fourteen original trustees of the Forest Lawn Cemetery association, who incorporated the institution in 1885, but four are living, and they are: Moses H. Bliss, Eben K. Long, Arthur P. Wood and Orlando S. Wood. These original trustees, as well as the present directors, are heartily in sympathy with the bird conservation movement, and promise that everything shall be done to maintain this as the best, if not the very first cemetery bird sanctuary in the United States. That this is actually to be the case is made sure by the fact that Forest Lawn is not operated for profit. There has never been a dividend declared and there never will be. Every cent of profit from the institution goes back for improvements and upkeep, in which the birds will figure largely in the future. Next winter several big feeding stations are to be erected in different parts of the cemetery, according to Mr. Mann, and the special officers guarding the sanctuary will be ordered to keep these stations well supplied with suet, cracked nuts, broken bread and the like. This movement, with the perfect protection both summer and winter, and the bird baths in the former, are certain to make this a paradise for bird students in all seasons. One of the chief delights of the Forest Lawn sanctuary is its easy access, swift and frequent street car service taking the student into the very heart of birdland in less than an hour. Today the immense lilac and spirea bushes are in full bloom and the foliage at its best. It is time that feathered friends take advantage of this opportunity. The Audubons are already planning a field day at this reserve. Omaha should be proud of the fact that she has one of the first, best and biggest cemetery bird sanctuary in all the country, and one which will be copied after for years to come. Wren house on the old willow at Forest Lawn. Scene in Forest Lawn, bird home.